When you have Asperger’s Syndrome, social situations can be tricky. While neurotypical individuals understand social rules and norms instinctively, those of us with Asperger’s struggle to understand the complex situations. Perhaps nowhere is this trickier than in the area of humor. A sense of humor can be a great social tool. Telling jokes can bring people together and understanding jokes can help people get along. Unfortunately, humor is a thin line. Too far one way and the joke isn’t funny at all. Too far the other way and the joke can come off as just rude or even offensive. If social situations in general are a confusing maze for Aspies, humor can often feel like a minefield. Everyone else seems to stride across it without any problem but the instant we try to venture within, BOOM! I’ve seen NHL in many situations attempt to tell jokes. To be perfectly honest, it isn’t his strong suit. He thinks what he is saying is funny, but at best he is referencing something other people don’t know about and at worst he is coming across as being mean. He can also not know when to stop. He might say or do something funny, but then he tries to get further laughs by either repeating the action or ramping it up. This quickly turns from funny to disruptive, but he doesn’t see that. On the flip side, NHL’s literal nature can mean that he takes a joke told to him seriously. All too often, I’ll kid with him and he’ll think I’m being serious. My joke backfires and he begins worrying that I’m going to be doing something really bad. Of course, being an Aspie myself, humor isn’t my strong suit either. Perhaps you’ve seen me online telling jokes. Hopefully, you’ve found them funny. Here’s my secret, though. Most of the time, I write those jokes, erase them, re-write them, and slowly hone them from a barely humorous idea to something that might make people laugh. When it comes to face-to-face conversation, humor is trickier. If I’m with people I feel comfortable with, I might tell a joke or two if they pop in my head. Otherwise, though, my joking is very limited. I often feel like everyone else’s mind is moving quickly when it comes to humor while mine just plods along. When it comes to getting jokes, I will get many of them. I’ve spent years learning about the intricacies of humor. Still, I sometimes find myself taking someone too literally when they were only joking around. Social media has helped me in real life humorous situations, though. Social media can often be like a training ground. Since the jokes don’t need to come in real-time, I can try out various things to see what works and what doesn’t. If a joke bombs, I’m presented with the usual assortment of screen names, not with faces showing disgust, rolling eyes, or anger. On the flip side, verbal cues are lost when a joke is typed out. This means that everyone get saddled with the same lack of ability to tell joke from seriousness that Aspies live with every day. Many people might add a some non-verbal cues to their jokes – such as a emoticon – to help people understand that they aren’t being serious. These cues can also help Aspies to spot the joke. Even if these cues are absent, though, we can read and re-read the statement until we discern whether the intent was serious or not. Again, lack of real-time helps us and this practice can be carried over to face-to-face situations. I know that NHL will get better at humor. He really wants to be funny, but given how often he wildly misses the mark, I find myself telling him not to attempt jokes. I’m torn, though. I don’t want him to grow up humorless, but I also don’t want him offending someone or getting in trouble because he told a joke badly. In the end, he’ll need to walk the thin line of humor until he figures it out. I’ll do everyone I can to help him across the humor minefield. 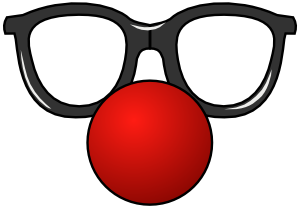 NOTE: The "Funny Glasses 2" image is by ghosthand and is available from OpenClipArt.org.